...AND MASTER AT CREATING AN ATMOSPHERE. In the heart of the city centre is my choice for the traveller who won’t accept anything less than a 5-star stay. 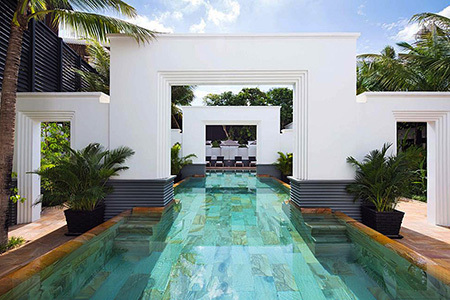 For a city that receives 2 million visitors a year, Siem Reap has relatively few options in the way of upscale hotels. 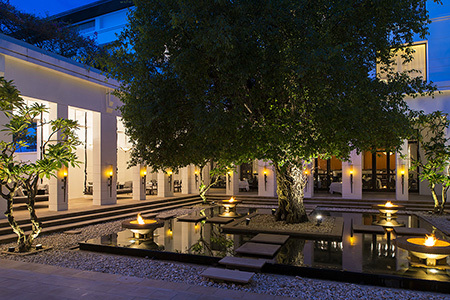 The Park Hyatt Siem Reap is the one of the very few luxury hotels in downtown Siem Reap - a mere 3-minute walk to the nightlife and shopping districts, and just a 15 minute drive to both Angkor Wat and Siem Reap International Airport. Happily, the Park Hyatt Siem Reap ticks all the boxes - tasteful and well-proportioned rooms decorated with both traditional Khmer and contemporary modern elements, a Dining Room and Living Room that are both dining and drinking destinations in their own right; and the exceptional, attentive, yet discreet service that one comes to expect from the Park Hyatt brand. The ruined remains of Angkor - the capital city of the Khmer Empire, which following its fall in the 15th century is now modern-day Siem Reap - is what put Cambodia on the map. 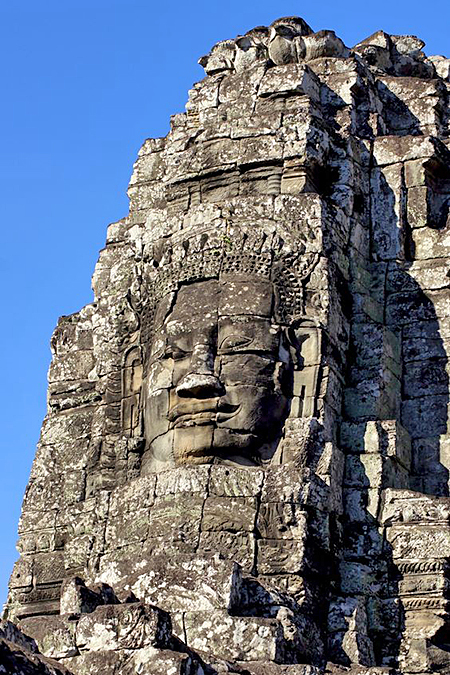 The most famous of her ancient monuments are the iconic Angkor Wat (itself the symbol on the country’s flag); Ta Prohm, the famous “Tomb Raider temple”, and the giant stone faces of Bayon (left) in Angkor Thom (above). But with over 1,000 temples spread out across the 400 square km of Angkor Archaelogical Park, it is impossible to see it all, and so one has to pick their battles. While Angkor Thom (the site of Bayon, Baphuon, Phimeanakas, and Elephant Terrace) Angkor Wat, and Ta Phrom are all close together, I also highly recommend going out of the way to Banteay Srei - the Citadel of the Women, also misleadingly nicknamed The Pink Temple. If you have the time, I highly recommend buying the seven-day (US$72) 'Angkor Pass' so you can beat the heat by seeing the temples early in the morning or in the evening. I chose the three-day pass (US$62) because my stay was a short one, and I managed to visit Ta Prohm, Angkor Wat (twice! ), Banteay Srei, and Angkor Thom. Just...don’t try to be a hero and squeeze in too many temples on a one-day pass (US$37), even if you think you have the stamina - you’ll probably drop dead from heatstroke. GOLDEN HOUR AT ANGKOR WAT. BEST ENJOYED AT SUNSET. FEELING THE LARA CROFT FANTASY AT TA PROHM. Tonle Sap (Great Lake) truly beggars belief. Although it is strictly a lake - indeed, the largest freshwater lake in Southeast Asia - it feels more like an ocean, what with an endless horizon as far as the eye can see (sea?). Every rainy season, the Mekong River cases Tonle Sap to swell - swallowing up everything in its path including the trees that live in the lake - before reversing its flow and receding back to its original depth. These precarious conditions are a matter of daily life for the 1.2 million people who call Tonle Sap their home. Travel literature and tour guides will insist that no trip to Siem Reap is complete without a visit to one of the many floating villages of Tonle Sap. Personally, I wasn’t impressed. The entire experience reeked of poverty tourism. When you looked past the novelty factor of a floating town you’ll notice that the villagers drink and clean from the same polluted water they dispose their waste on. More digging reveals that many of the locals there, fishermen by trade (Cambodia produces about 400,000 tonnes of freshwater fish per year, the majority of which comes from Tonle Sap) are forced to survive the government regulation on fishing by keeping illegal traps under their homes. Suddenly, the cameras being shoved intrusively into my face when I boarded the boat, which culminated with a rather downtrodden-looking but persistent child begging me to buy said photo, is less of an annoyance but rather, a desperate attempt at eeking out a living on a hostile environment, where, ironically, access to clean water can be limited. Personally, I would not recommend a visit to the floating villages of Tonle Sap, only because it left a bad taste in my mouth. But of course, whatever floats your boat, hunty. If you insist on a visit, at least avoid Chong Kneas. Chong Kneas is an infamous tourist trap, notorious for many reasons - the full list of which you can read on their delightful TripAdvisor page (averaging 2/5 out of nearly 1,000 reviews). A tour boat stopping by a shop and strongly suggesting you buy a bag of rice for USD$60 for the local children, one can overlook. So-called crocodile farms where dozens of wretched specimens are cramped in too-small ponds, not so much. Unfortunately, these tourist traps run by the villagers exist out of necessity - locals do not get most of the money from the entrance fee (USD$30 per person) as the boat tours are run by a private company. If you’d like to support local trade that empowers rather than exploits, I highly recommend a visit to the workshops, boutiques, farms, and cafe of Artisans Angkor. 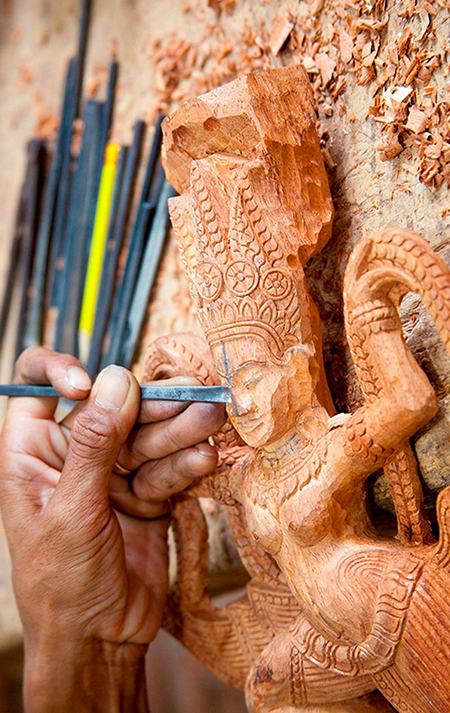 Artisans Angkor is a Cambodian social business creating job opportunities for young people in rural areas, while reviving traditional Khmer craftsmanship. The silk scarf I wore on this trip is a piece by Artisans Angkor (as were the several Buddha heads my mother bought then shoved into my luggage). Artisans Angkor has several outposts in Siem Reap: the workshops, main showroom and boutique in downtown Siem Reap; the Angkor Silk Farm in Puok District, Angkor Café in front of Angkor Wat, as well as a boutique in Siem Reap Airport. If you have time to shop at only one place in Siem Reap; or if you want ethically-made, high quality souvenirs with a message of hope, make it Artisans Angkor. 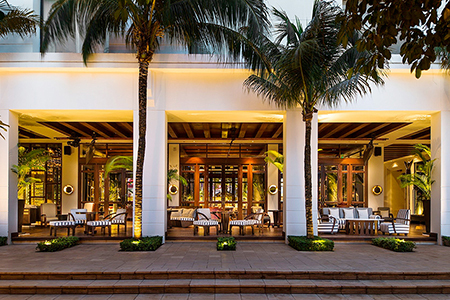 There’s a bittersweet story behind the excellent gastronomical offerings at The Sugar Palm. Chef Kethana, the owner of The Sugar Palm, lamented the loss of traditional Khmer cooking skills during the troubled times of the ‘70s. 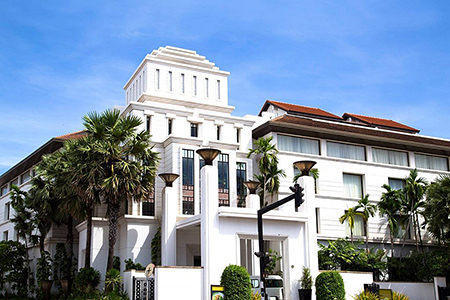 And so, upon her return to her birthplace in 2002, Chef Kethana opened restaurants in Phnom Penh and Siem Reap. Her mission was to serve traditional, home-style comfort food - the kind she learnt to cook from her mother and grandmother. Being a labour of love and celebration of Cambodian cuisine, the food at The Sugar Palm is, naturally, as authentic as it gets. Cambodian staples such as mango salads garnished with citrus, mint basil, and peanuts. Amok (parcels of steamed fish wrapped in a cup of banana leaves) cooked in curry and thick coconut milk. Crispy spring rolls followed by even crispier noodes that yielded a satifsying crunch with each bite. The scent and flavours of peppercorns, lemongrass, kaffir lime, coriander and galangal all transported me into a Cambodian dining room, filling my belly and infusing my senses with a true feel for Khmer culinary culture. A must-visit if you want to experience exceptional and authentic Cambodian soul food with a story behind it.